Last week, our entire Middle School spent Wednesday morning engaged in discussions and activities aimed at bringing our community together. Organized by Ms. Diana Talbott and a crew of student volunteers, Community Life Day is a chance for our middle schoolers to demonstrate leadership, camaraderie, and compassion — and to do so on their terms. Through initiatives like these, our students live our mission to truly know and value each and every member of our community. 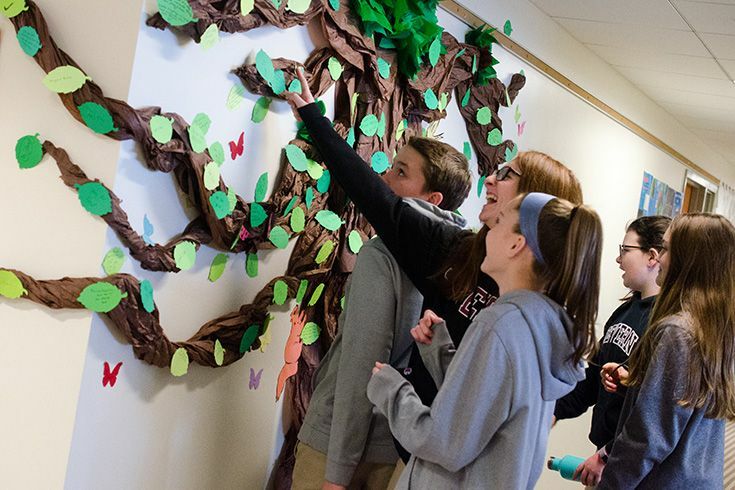 Community Life is part of the student leadership program for our Middle School and offers ways to help students participate in, embrace, and celebrate our Middle School community. 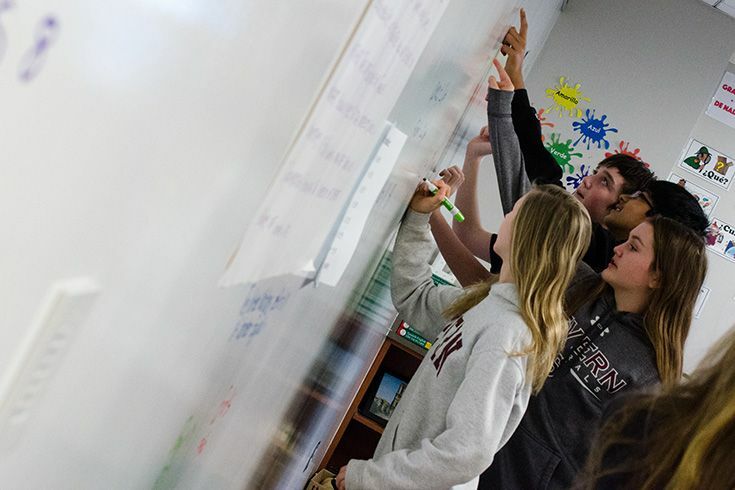 Community Life also creates opportunities for students to think about and discuss the larger issues of what it means to be part of a world community by exploring such topics as civility, equality, understanding others, and inclusivity. 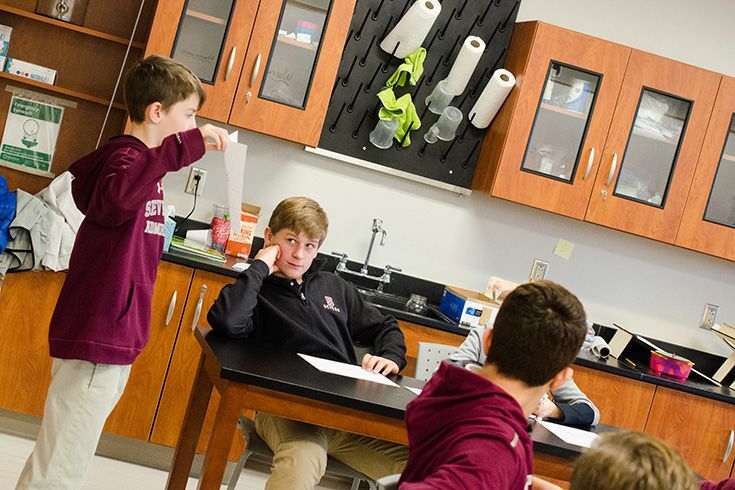 Although Ms. Talbott and our Middle School faculty help organize and are present throughout the day, the student Community Life Committee runs the show. They choose the topics, they plan the activities and they facilitate the discussions. These students are truly invested in the day, creating a purposeful program that they hope will resonate with their peers. Those attending are similarly invested, looking to their peer leaders for support and guidance through topics that can be uncomfortable. There is a relationship of respect during Community Life Day among all of our Middle School students — the goal is for that respect to expand beyond this day and become part of the fabric of their daily lives. This workshop (for 8th graders only) was all about terms and definitions related to gender and sexual identity. 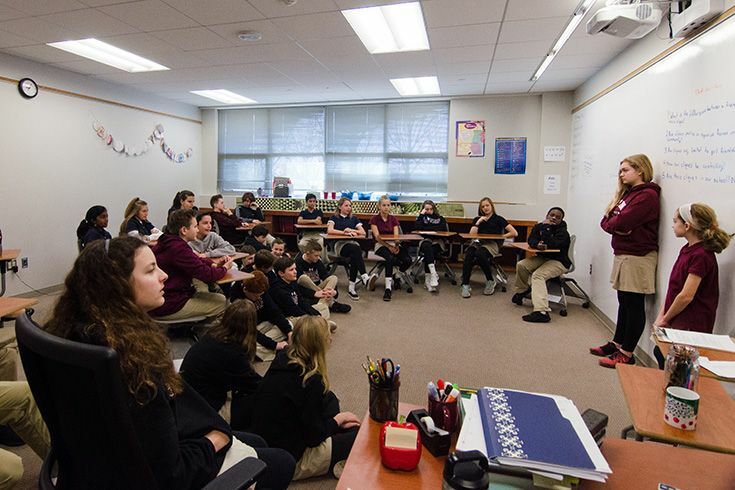 During the planning process group leaders met with Middle School Counselor Ms. Mary Foard to help organize their ideas and create a strategy to inform without implying values of right or wrong in their presentation. Before starting, our presenters set healthy expectations for the group. In this workshop, our CLC presenters passed out slips of paper with terms like “rights,” “class equality,” and “vote” along with paper and colored markers. They instructed participants to draw their own personal definition of that term. After expressing their ideas through drawing, some students chose to share and explain their image. This non-verbal activity was a way for students to express themselves without thinking in terms of right or wrong — it was an exercise in perception and understanding. Charlie Friedrich '24 shares with the group. This activity began with a discussion about words of encouragement. The group leaders asked their peers to talk about how it feels to hear encouraging words and to offer them to others. 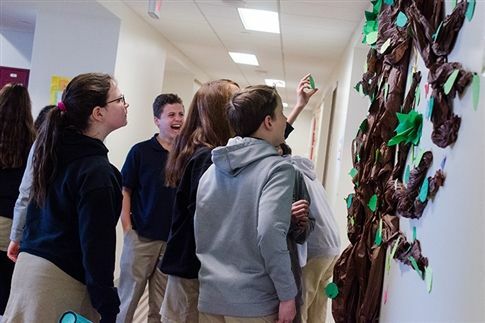 They then passed out paper “leaves” on which students could write words of encouragement and attach them to the “giving tree.” The tree will stay up until the end of the year for students to give or take leaves of encouragement. Placing words of encouragement on the giving tree. These discussion-based workshops explored different ways that culture can be represented in our Middle School community. Group leaders encouraged everyone to think about what diversity, identity, and culture really mean. 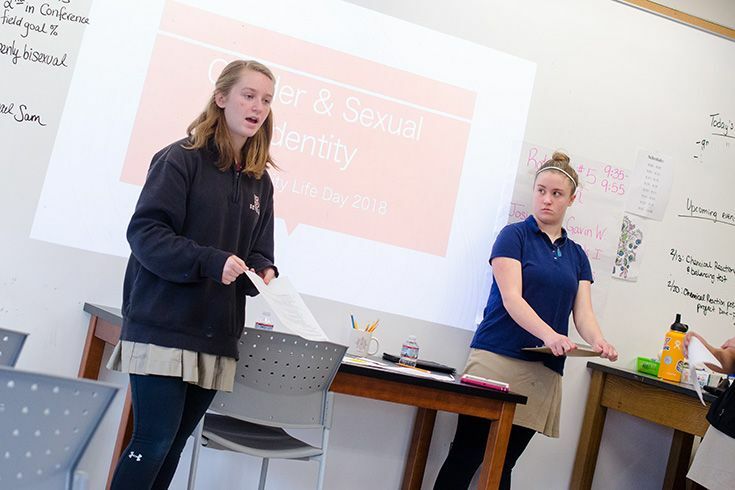 They shared examples from their own lives and asked participants to do the same, in hopes that sharing their differences could help their peers develop empathy for one another’s individual experiences. Raeha Richman '24 and Riley Condon '22 were two of four group leaders for these sessions. Another group discussion-based session, this workshop explored concepts of friendship and cliques, encouraging participants to consider power dynamics, popularity, and control as applies to friendships. They talked about strategies for creating more inclusive friend groups in our community. 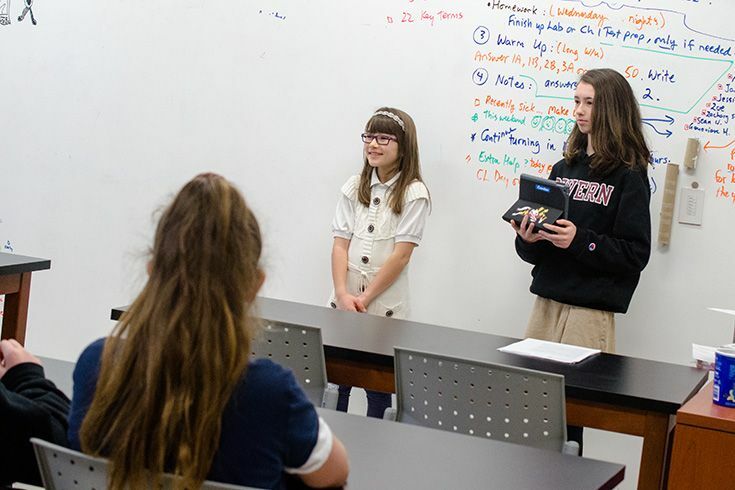 Mia Groff '23 and Madie Wright '23 lead the group in a discussion. They were two of four group leaders for these sessions. Workshop 6: Men’s Work or Women’s Work? In this lively, activity-based session our students played games to refute common gender stereotypes. Prior to beginning the games, leaders surveyed the group about different types of work and whether it was better suited for males or females. They staged a boys vs. girls style contest and math contest to demonstrate that ability isn’t tied to gender and then repeated the survey. Many of the group members stated that their opinions had changed by the end of the workshop. It was a race for the answer during the boys vs. girls math contest! At Severn we strive to make sure that every student is represented and heard. We want our students to learn how to express themselves in healthy, productive ways — to see the value that our differences bring to our community and as vital reflections of our larger society and world. We teach leadership and good character by example every day. As our 6th, 7th and 8th graders work together to plan and participate in Community Life Day, they learn to model these qualities for one another. This program gives our students the tools and vocabulary to understand and better defend their values, empower themselves, and advocate for others. The "giving tree" was a fun way for students to learn strategies to support one another.